I was surprised to look at the calendar next to my desk yesterday and notice that it was still showing September, despite the fact that we are two-thirds of the way through October. Students everywhere are, like it or not, settled into their school routines. They should be by now, right? In my district, the first quarter ended last week. I’ve got a handle on my boys’ routines, but I’m still working on my own. Really, I don’t like the word routine. It’s such a blah, dry-white-toast word, bringing to mind the obligations of grocery shopping and exercise and unloading the dishwasher. I much prefer the word ritual, which implies a routine of a higher order. But ritual can also be a little intimidating, because I tend to overthink things and feel that I must get it exactly right. So I was really pleased when my sister gave me Daily Rituals—How Artists Work, by Mason Curry. 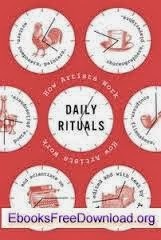 The book is a most fascinating, enlightening, and often quirky collection of the work rituals of 161 “inspired—and inspiring—minds.” Novelists, painters, philosophers, mathematicians, and the like, joined by the common thread of adherence to daily ritual in the pursuit of their life ambitions. From the early risers to the night owls, from the substance abusers to the ascetics, from the gregarious to the solitary...there are as many paths through the creative process as there are minds to think them up. Some work(ed) daily for hours, others for much less. Gertrude Stein rarely wrote for more than half an hour a day. Anthony Trollope fit in three hours of writing in the morning before heading off to his civil service job, requiring 250 words from himself every fifteen minutes. What I appreciated most about this book, aside from fascinating peeks into the private lives of famous people (Patricia Highsmith really smuggled snails in her bra? ), is the reassurance that there is no right way for me to construct a writing ritual. There is only my way. What makes your writing ritual work for you? Hi Jenny. This sounds like a fun read. It's always nice to see how others go about creating and to see there's no "right" way to do it. There's just our own way. Personally, I am a creature of habit, so I tend to do things in the same order each day...except for writing. My writing just happens when it happens except for November and NaNoWriMo when I'll actually follow a rigid schedule. Now that my husband is gone, and I no longer have my job to take up a lot of my time, whatever regimen I follow should work, right? Well, sometimes it does, and sometimes it doesn't. In the past year since my husband's death, I've been experimenting with different schedules of what I do when each day. I'll check out this book you recommended. Maybe it'll give me some inspiration. Oh Pat, November is almost here! I'm glad to know you're in the game again this year. Abbie, I'm so sorry about your husband! I can imagine that your world has been turned upside down. I'm glad you're motivated to find a schedule that works for you. Writing is great therapy. Best wishes.